In the last few months I’ve been asked/put myself forward to film and live stream some events. During my rather weirdly-spent youth, I was producing videos for my school of its plays and other staged events, and even got roped into a couple of weddings and corporate videos before I was even 16. It’s something I’ve kept a backburner love for, even though in the last 17 years I’ve only done a couple more weddings and not a lot more. The Twitter Joke Trial gig which was first rumoured almost a year ago got me fired up again and I was hoping to stream that. In my inevitably frivolous way I went and bought a load of kit (the cheapest I could get, mind) ready to do my bit for the cause. Unfortunately the agents of the talent objected, so it never happened. Come June, with all the stuff sat about, I had an email from the organiser of Sheffield Tramlines Festival to see if I could help with a ‘live stream’ from the main stage to a nearby bar. After a bit of to and fro and meeting up to discuss it all, it was clear it was less ‘live streaming’ and more ‘closed circuit’ – something I was still up for, but the hazard of me having to run a 200m cable across public areas probably put them off and they went with a local AV company. Fair enough, I was kind of dreading it in case it all went wrong and/or I killed someone with wiring. 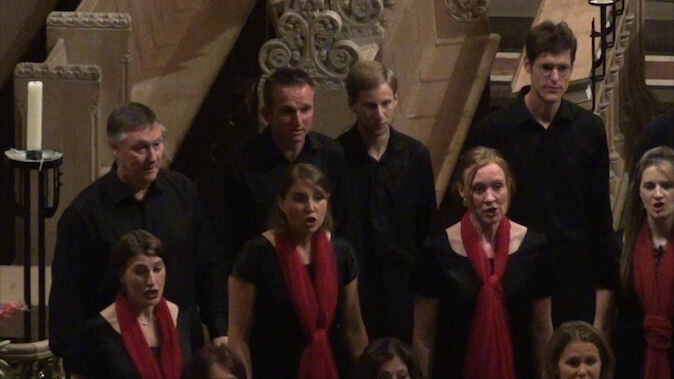 My friend Chris (@varnom) sings in a local choir, the Abbeydale Singers and had been asking me throughout the early part of the year if I would film their 25th anniversary concert. I said I would, and I was, again, excited. This time it happened. Hooray. So on the 14th July, two days before the concert, I went down the road to the church where the choir were rehearsing and said hello, played about with some camera angles, took some cutaway shots and got all excited. (I did however manage to break a camera and lose part of a tripod which was remedied on both counts thanks to Chris). On the day of the concert (16th), the recording went really well. I got a position in the triforium (a new word for me too, basically, upstairs in a very narrow bit of the church with windows) and operated two cameras – the wide shot and the close up of the choir. 3 other cameras were positioned, at the front of the church so you can see the whole audience, at the back so you can see Kev the conductor from a sort of ‘choir view’ and one which moved from the organ to the piano between the 1st and 2nd half of the concert to get needed cutaways when there’s a long instrumental bit. I broke all sorts of conventional 180 degree rules to be honest by putting the cameras there, but the views were nice and there were few alternatives. So! How did it go? Let’s just say, it’s 18th August and I’m saving a Blu-ray image as I type, ready to burn to disk when I get my (cheaper than I thought) Blu-ray writer tomorrow. 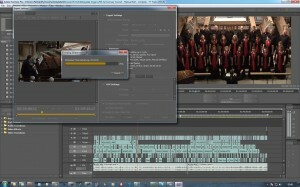 I’ve done a DVD, 20 YouTube clips, a CD and a full 2hr video export to Vimeo. To be honest, none of this was asked of me. They thought I’d turn up with a camcorder and stand at the back. Which I sort of did – just with 4 more and up a bit. I thought I’d write the blog post though because it’s been a tremendous learning curve, during which I’ve had to completely update my PC – which for you geeks is now an i7 3.4GHz jobby, 16GB RAM, 2xTB drives and a Geforce GTX570 graphics card – plus upgrade my version of Adobe Premiere to CS5.5 to make the most of the new hardware. Two of the cameras ran out of memory before the end of the concert. What a pillock! It was literally in the last couple of songs thankfully. I had done a ‘dry run’ at home and the 16GB SDHC cards in the cameras took 4 hours worth – but for some reason scraped about 3 on the night (think it was the fact things actually moved and the camera wasn’t just left pointing at a pile of laundry for 4 hours). I had contemplated changing all the cards at the interval (and had brought spares), but didn’t and in hindsight I’m glad I didn’t as it would have been a panic to position the camera which was on the altar at the back so it was perfectly symmetrical again for the 2nd half (I had to use my MacBook as a monitor as it was up so high I couldn’t see its own screen) and also I had to swap the ‘organ’ cam to piano in time. Chris did help on that front though bless him, he’s supposed to be mingling with the audience having a glass of wine at that point! So never mind – the last two songs mostly just have 2 camera angles. 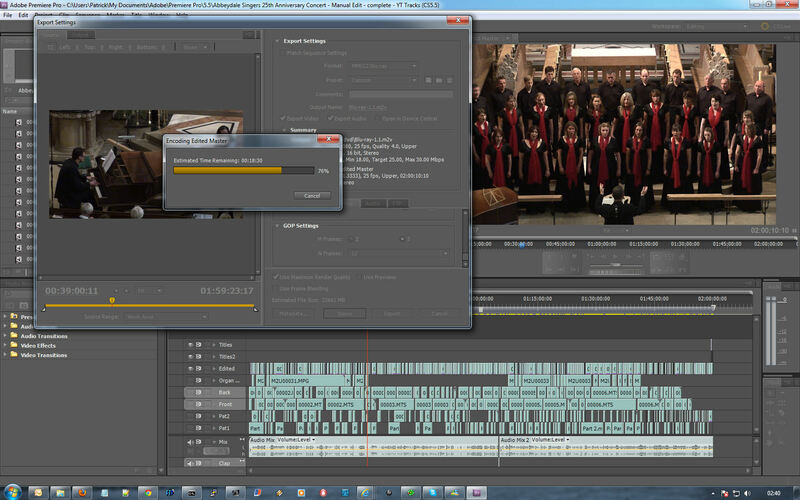 Adobe Premiere and Encore can be an utter bloody nightmare before you’ve learned to tame them. Premiere’s an animal, and before I’d upgraded my PC, trying to edit the various formats (HDV, AVCHD and plain MPEG2 SD) on the same timeline would randomly crash it. I had one of those “lost all the morning’s work” moments in the early days of the edit which I learned from! The new PC made things infinitely more stable though thankfully, and easier to edit with. We had hoped to use Premiere’s “Multi-Camera” tool but the old PC was far too rubbish for it to work and by the time I’d upgraded the PC we were half way through. Again, though, in hindsight I’m glad I did everything manually because there’s far more attention to detail. I just want to go back in time now I know all the music and tell the month-ago me where to aim the closeups at, at which point in each song! I recorded the audio from the church’s PA system via a wireless link to my MacBook next to me. This was so I could get a clearer recording of Kev the conductor’s little intros to each piece between songs. The Mayor of Sheffield was there and she also spoke just before half time – I say spoke, she basically shouted down the microphone and I had no-one operating the sound desk to turn her down, so all her speech was distorted and nasty – not even the declipper could fix her… so I had to blend in the choir audio which is very echoy in her speech. Also, I wasn’t expecting there to be an FM whistle on a particular frequency throughout the PA recording, but it was there. We figured it out in Premiere with a brilliant visual equalizer tool, and removed the whistle, leaving everything else in tact. Adobe Encore forgets to inform you that if you’re constructing ‘Menu Pages’, they’re only used in Blu-ray, not DVD. So, thanks. I had to do them all as seperate menus (only 3 of them) but that was a whole day wasted! Then finding it wouldn’t encode with the brilliant error ‘Encode failed’. Oh God this is rambling on, I won’t bore you more about this – but yes, at least another day wasted actually getting the thing on a DVD. Once on a DVD, various spazzy things seem to happen to transitions and the quality in general. It’s taken about a week to come up with the optimal settings and even this evening I still had an issue with one thing which eventually I figured out. Honestly – some of the procedures I’ve had to learn is what the pros call ‘workflow’ it seems, I call it annoyingly inconsistent software. So much improvement to be had. My cynicism told me I wouldn’t enjoy the music, but now perhaps it’s a case of having heard it all quite literally 100+ times and it settling into my subconscious; I honestly think it’s all quite powerful, enjoyable and incredibly pleasant to listen to. Guess what – I’m listening to it right now, out of choice. Lizzie’s going to kill me. Plus the CD of it got stuck in her car radio and I haven’t told her yet. It’s been a learning curve. And I did it all for free. 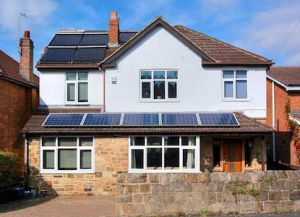 It’s been a welcome distraction to my main business (which isn’t doing brilliantly) – I’d love more jobs like this, especially now I’ve got over the hump of learning, it shouldn’t take me a month to do something relatively simple next time. Two different PCs – first was 2.4GHz Core 2 Duo, 4GB RAM. Couldn’t cope. Second was more up to date (as mentioned above) and just about coped. I’ve run out of things – oh yes. Brain cells were used. Some were re-energised for sure. It’s now 5.08am and I think I should probably stop typing. Feel free to ask any questions of detail I clearly have missed out somewhere.